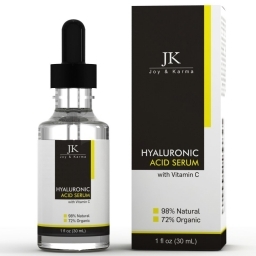 Joy and Karma Hyaluronic Acid Serum is 98% natural and 72% organic, with vitamin c. I feel that being organic products are usually excellent and this one is no different from the sum of our experiences. The vitamin c is a major plus. It's so good for you in many ways. Joy and Karma Hyaluronic Acid Serum also contains aloe vera, Witch Hazel, MSM, jojoba oil, green tea, geranium essential oil and vitamin e.
I use the serum in the morning and in the evening, before retiring for the night. I really like the results. My wrinkles are less visible in a short period of time.